A typical fishing charter starts off leaving the dock anywhere from thirty minutes to an hour before sunrise. The boat ride can range from twenty minutes to over an hour; this depends on the time of year and what type of fish we are targeting. The charter will usually last eight hours, but it can be more or less depending on the situation. 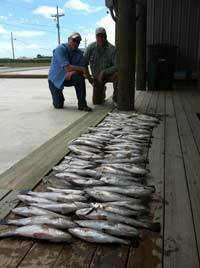 For example, let’s say fishing is tough in the morning and we only have around twenty or thirty fish in the ice chest. 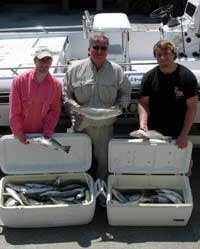 All of the sudden, thirty minutes prior to heading back in, we find a great bite and are catching them one after another; we will be happy to extend the fishing trip at no extra cost. On the other hand, if the bite is great in the morning and we finish our limit early, some customers like to head back in to beat the heat. Some trips we will use artificial baits, and some we will use live or dead bait. We will try to use artificial as much as possible, but some days live bait is all the fish want. If shrimp season is open, we have a net that we tow behind the boat to catch our own bait. If you have not experienced catching bait this way, I highly recommend it. If shrimp season is not open, then we will have to buy the live or dead bait. We furnish rods with spinning reels. If you would like to bring your own, please feel free to do so. We strongly recommend bringing your own bait-casting reel, but if you cannot let us know ahead of time so we can make arrangements to provide one. You are encouraged to bring a cap or hat, sunglasses, sunscreen, rain gear, soft soled non-marking shoes (preferably deck shoes, flip flops, crocs, or tennis shoes), food, drinks, ice chest to take your catch home, a camera, and a fishing license. All children under sixteen are required to wear a life-jacket while the boat is in transit. We do not have life-jackets for small children; please bring your own. We carry adult size life-jackets, and these will not work for small children. A fishing license is required for each person sixteen years of age and older who wants to fish. 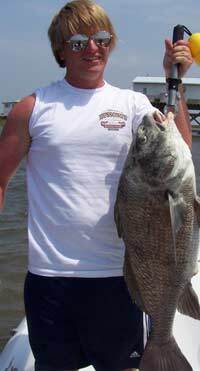 Louisiana offers a three day resident or non-resident charter fishing license for $10.00 plus a handling fee. There are several ways to obtain a fishing license prior to your fishing trip. One way is to do so online at http://www.wlf.louisiana.gov/licenses. Another way is to call the Louisiana Department of Wildlife and Fisheries at 1-888-765-2602. The third way is to visit any Louisiana store that issues fishing licenses and purchase one there. A few stores throughout Louisiana who do this are Academy and Wal-Mart.